Asus has been a leading game changer in the smartphone race in India and around the world. Asus’s Zenfone series was always about innovating its current technology to give the user the best of smartphone experience there is and which can be. 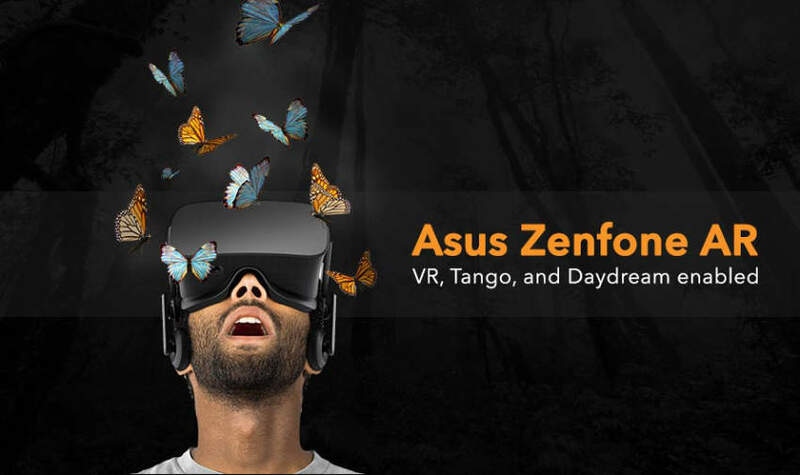 The Asus Zenfone AR specs includes the presence of an ASUS ZenUI 3.0 along with the latest Android Nougat Operating system. Under the hood is a Qualcomm MSM8996 Snapdragon 821 chipset and a Quad-core (2x2.35 GHz Kryo & 2x1.6 GHz Kryo) processor along with an Adreno 530 GPU. The phone is powered by a powerful 8GB RAM unit. This is the first phone with 8GB RAM. The Asus Zenfone AR camera consists of a 23+8MP camera unit. The 23MP primary camera features f/2.0, OIS (4-axis), 3x optical zoom, phase detection autofocus, depth & motion tracking sensors, f/2.0, OIS (4-axis), 3x optical zoom, phase detection autofocus, depth & motion tracking sensors. The primary camera records 2160p videos @30fps. The selfie shooter on this superfone from Asus is a 8MP camera with a aperture of f/2.0 and records 1080p videos. The Asus Zenfone AR price is billed for the super display structure it comes with. The home button in the lower bezel in the front comes with an integrated fingerprint scanner. The 5.7-inch Super Amoled Screen gives out a high output resolution of 1440 x 2560 pixels with a pixel density of 515 pixels per inch. This screen is beautifully crafted into the chassis of the phone with a screen to body ratio of 72.6%. This screen units supports multi-touch up to 10 fingers and the phone is protected by a Corning Gorilla Glass 4 unit. The Asus Zenfone AR specs of its storage capabilities is beyond impressive. It comes with 128 GB storage variants and all of these variants support the use of expandable memory up to 2TB. The lack of a dedicated slot for memory is felt. The Asus Zenfone battery unit is a 3300 mAh unit that keeps the phone powered for long hours. Thanks to the powerful updated processor and built-in vapour cooling. Power consumption is rapidly reduced. The Asus Zenfone price in India is to be speculated to be around 32,999 and has become one of the most awaited phones for the year 2017. The phone’s 8GB RAM, cloud storage, adequate storage, DTS sound unit and fast processors make the phone a good buying option. It will be competing with OnePlus 3, Pixel, Iphone 7, Samsung Galaxy Note 7 and more. Asus Zenfone AR full specs and reviews as of Apr 2019. Buy it here!